My book, Climate Crisis and the 21st-Century British Novel, is published on November 2nd. In it I discuss how a wide variety of literary fictions reflect contemporary awareness of climate crisis, and participate in the construction of the stories that we tell about climate crisis. In the weeks leading up to and following the book’s publication, I’ll blog about the book in some more detail than I have done so far. In this post, I want to give some background to how I got started on the book’s topic. If you’re interested in reading more on the process of writing the book proposal and the book, you might find the posts I wrote for PhD2Published useful. Last month, The New York Times ran an article on what they call “climate-themed fiction”. 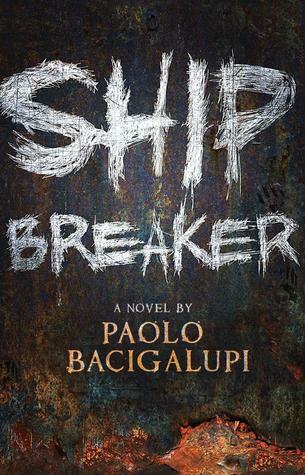 Taking the links that people have drawn between recent hurricanes and Paolo Bacigalupi’s 2010 novel Ship Breaker as a starting point, they asked whether this and other novels could become reality. This question ties in with what inspired me to write Climate Crisis and the 21st-Century British Novel: the ubiquity of climate crisis in our cultural sphere, and the role that novels play in helping us think through the shape climate crisis might take. Novels, I think, are particularly good at capturing whatever humans face. They are especially good at imagining human relationships and immediate environments — two areas that are bound to change as a result of climate crisis. But novels are not just mirrors of contemporary culture – they also offer ways of thinking through situations. Like the novels in The New York Times article, they present future situations, but especially also how they affect human relationships. Novels, in short, don’t only reflect how we imagine climate crisis, they also actively shape these imaginations. In Climate Crisis and the 21st-Century British Novel I write about the position of novels in a time of climate crisis, and especially the kinds of narratives they draw on. The bigger story of climate crisis is, I argue, reflected in different ways, in different types of narratives that resurface in novels, films, advertisements and other cultural expressions. The four narratives of climate crisis I focus on are collapse, pastoral, urban nature and polar environments, and over the coming weeks I’ll explore these four narratives some more.